The Sonoris DDP Creator is a standalone cross-platform CD authoring application compatible with virtually any DAW software on the market. The DDP Creator lets you assemble professional RedBook compatible audio CD's and supports the import and export of DDP 2.00 images and Cue Sheet (cue) files. It also enables you to burn and rip audio CD's and send off images with FTP. With the DDP Creator you can assemble a RedBook compatible CD by just dropping mastered 16 bit wav or aif files on the workspace and set the track order. After that you can adjust the spaces between tracks and audition this by playing back the transition from one track into another. Then edit the PQ points, ISRC, MCN and CD-Text data. Finally export to DDP, Cue Sheet or CD and print a PQ sheet if needed. The main feature of the DDP Creator is the sample accurate export of the CD project to a DDP 2.00 fileset. The industry standard DDP protocol is supported by all major CD replication plants and ensures an error free transfer and manufacturing of your masters. No more need to burn a physical master CD any more! Besides DDP export the DDP Creator can import (loadback) a DDP fileset too, including DDP images made by other software, like Bias Peak Studio (XT), Sonic Studio HD, SADiE, Sequoia or Pyramix. This feature allows you to check the project including all PQ codes, ISRC, MCN and CD-Text data. You can edit the project, playback tracks and export to DDP, Cue Sheet or burn a Redbook compatible CD from it. The Pro option allows even more control and adds Enhanced CD support to the DDP Creator. You can create Enhanced CD DDP filesets from within the program by adding an ISO file to an audio project. This can be an (Hybrid) ISO file made with for example Toast or an ISO file made with the DDP Creator by converting a folder holding the data files. Most DDP software packages or add-ons are very expensive, but the DDP Creator is competitively priced. Together with the powerful import features it is the perfect choice for everyone who needs a professional CD authoring and DDP solution without the need to switch to another DAW software. For example, you have assembled a CD in your favorite audio editor but need to deliver a DDP fileset? Simply add audio files or use one of the powerful import features like .cue Cue Sheet files from Wavelab, CD Architect .wav image files or Pyramix .pmi files or rip a CD and then export the project to DDP. 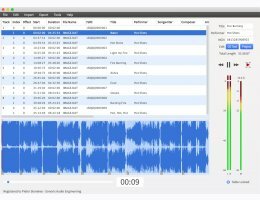 DDP CREATOR standard is a standalone application for Mac and Windows computers. Request your Demo Here of the DDP CREATOR.